Cesar's Auto tech is a business dedicated to operate a complete auto repair. 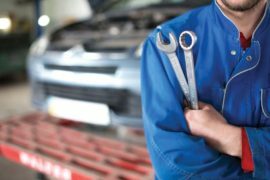 We know how important your vehicle is to you and that is why we offer a variety of different services that will keep your vehicle in top condition. We have a competitive prices and satisfaction to all our customers. We have been working since 2001 and our facility has been a symbol of honesty, affordable, and professional auto repair services. Cesar is the owner as well as the lead technician. He has over 25+ years experience in full auto repair and maintenance.